Welcome to my current dessert obsession. 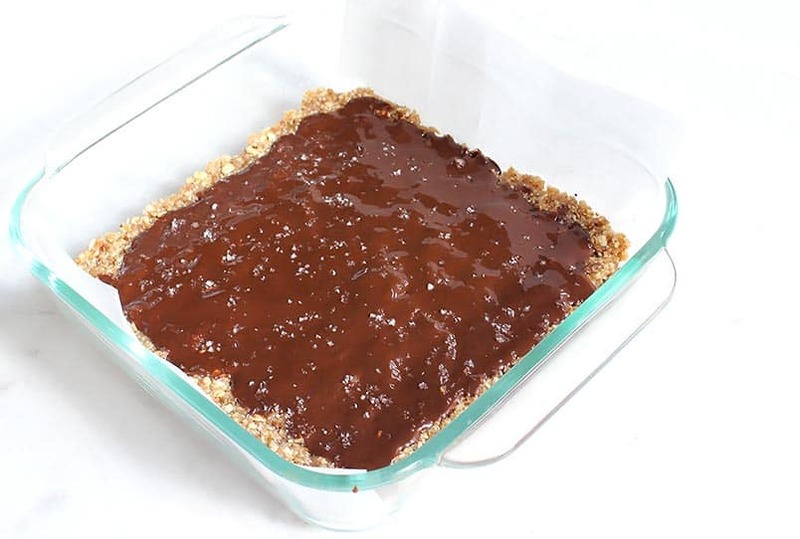 It’s a healthy re-creation of my all-time favorite childhood dessert, oatmeal bars with a chocolate topping. I made them ALL THE TIME as a teenager. Let’s start with the Dark Chocolate and Sea Salt version. It’s good. Really, really good, IMO. This does not taste like a “healthy” treat. You will not feel deprived at all. I promise! First, you should know these are no-bake freezer desserts. So you will be able to hide them in the freezer for you and you alone. Because, duh. Or if you want to share with others, you can ration as you please, because who will think to look in the freezer? Right. Nobody. Second, I made this version in a bar form because it is uber quick. You do not need to run out and buy a fancy pan. You could literally spread the bars out with the palm of your hand or a spoon on waxed paper! 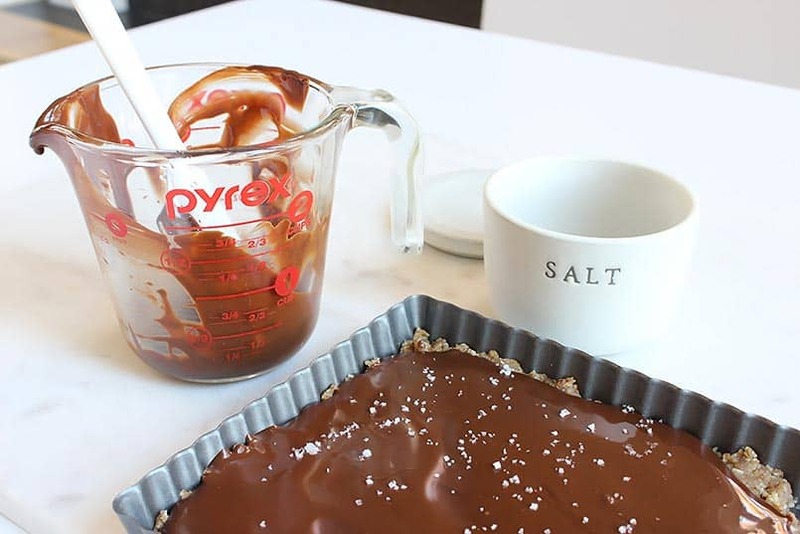 Or you could also use your trusty 8 x 8 inch Glass Pyrex Pan . This recipe is very flexible! The fancy Wilton Non-Stick Tart Pan is super quick too, but a tad prettier. I found mine at TJ Maxx, but you can also grab yours on Amazon. These pans give all desserts an upgrade. I’ve used mine for quiche, fruit tarts, pecan pie bars, and brownies. What I really love the most tho, is the bottom pops out so your dessert is so easy to remove. You will love it! Sorry, I digress. Fleur de Sel Sea Salt and Dark Chocolate. Oh yeah. 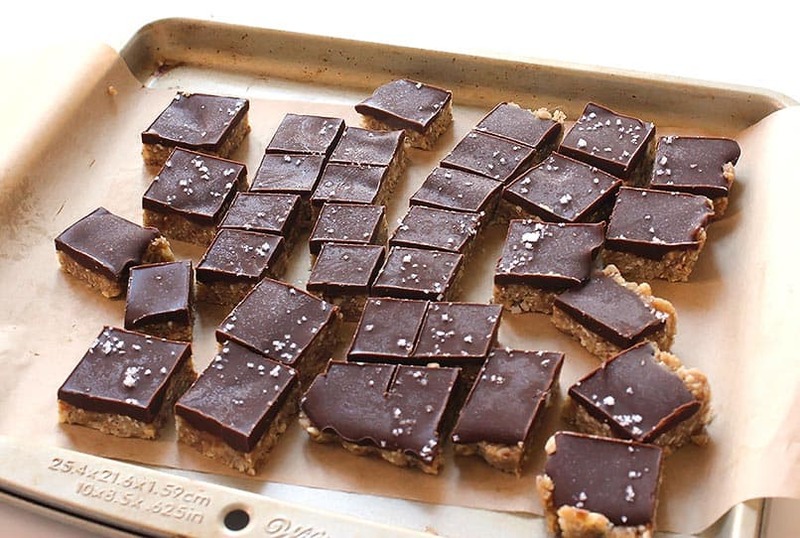 I do need to mention the obvious highlights of this recipe, dark chocolate and sea salt. Yes, an AMAZING pair. I ordered Fleur de Sel French Sea Salt from William Sonoma. I’d read the rave reviews about it for a long time and finally pulled the trigger. Try it, you will not be sorry. It’s not cheap so I save it to finish special dishes and treats. I used Lily’s Dark Chocolate Baking Chips in this recipe version, but there are a million great dark chocolates out there that would work equally well. I really like this brand, because it is sweetened with stevia. Besides dark chocolate, this recipe uses dates for sweetness. Dates are a natural sweetener, and contain vitamins and minerals that are good for you, when consumed in moderation. The sugar found in dates is called fructose. It is a particularly damaging form of sugar. Fructose has been found to cause inflammation, deplete minerals, and cause other stresses in the body. In other words, if you eat too many, they can be bad for your health and your waistline. 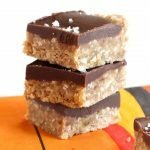 If you enjoy this recipe but can’t stop eating it, you may be interested in my similar bar recipe, Oatmeal Bars with Dark Chocolate and Peanut Butter which is sweetened with stevia. When shopping look for non-GMO, organic stevia or erythritol. Both are natural sugar alcohol sweeteners that contain zero calories or sugar. Stay mindful of how much sugar you consume. For more info, check out my post on sugar, The Negative Effect of Sugar on The Body. So, what do you say? Shall we begin? Here’s what you need to make this recipe. 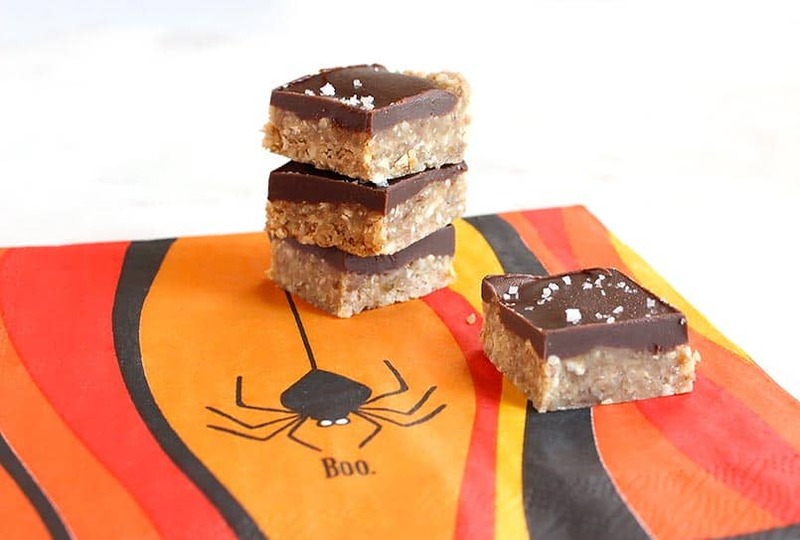 Delicious bars with an addictive salty-sweet flavor! Soak the dates in warm water for 5 minutes to soften, then slice in half and remove the pit. 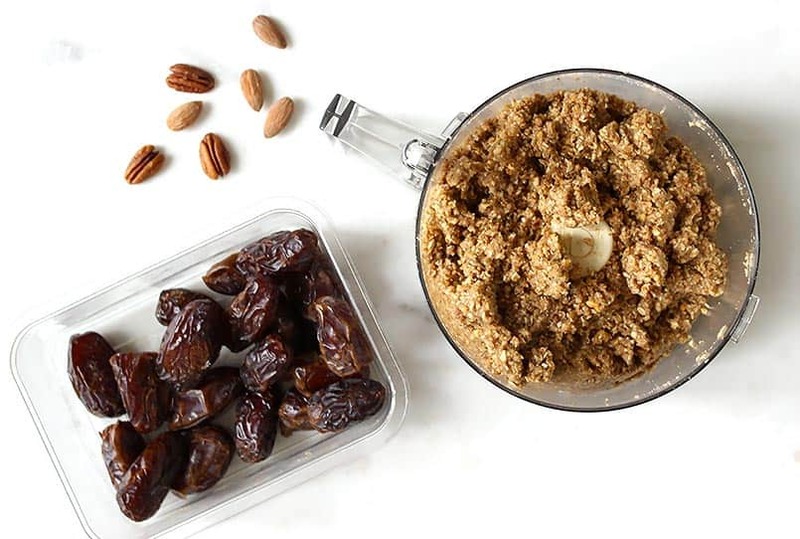 Place the pitted dates and the rest of the ingredients for the bars in the bowl of a food processor. Pulse until the mixture is similar to “cookie” dough texture. Wipe sides of processor down with spatula and pulse again. Press dough flat and even in pan or shape on a sheet of parchment paper. Put in freezer to harden. Melt chocolate in a glass container in microwave or double boiler. Stir constantly. Do not overcook. When smooth, drizzle or pour chocolate solid over bars. Your choice! Wait a few minutes for chocolate to set, but not harden completely, then sprinkle sea salt on top. You don’t want the salt to sink into the chocolate, but you do want it to stick to the surface. Let cool. 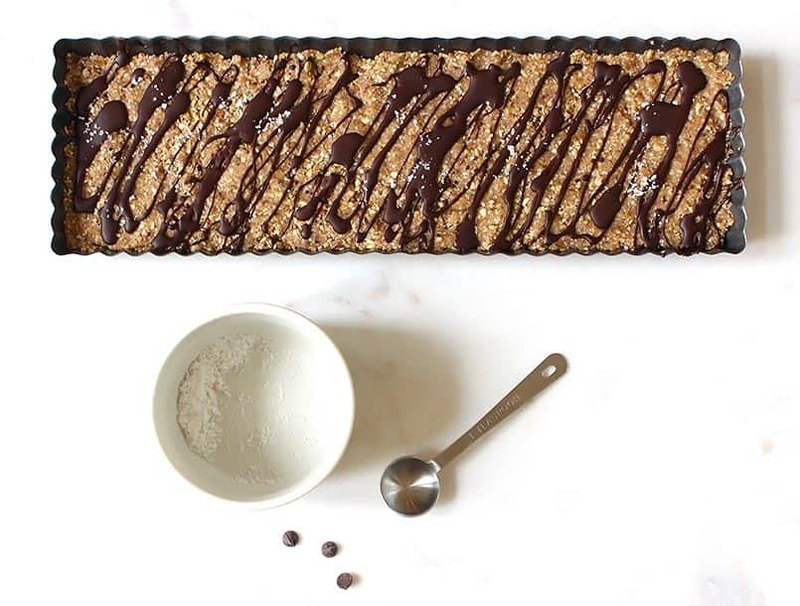 When chocolate is hard, remove bars from pan and slice into bars with a knife. For a thinner layer of chocolate topping or chocolate drizzle Use half the topping recipe. Use 1/4 cup of dark chocolate chips OR 2 oz. 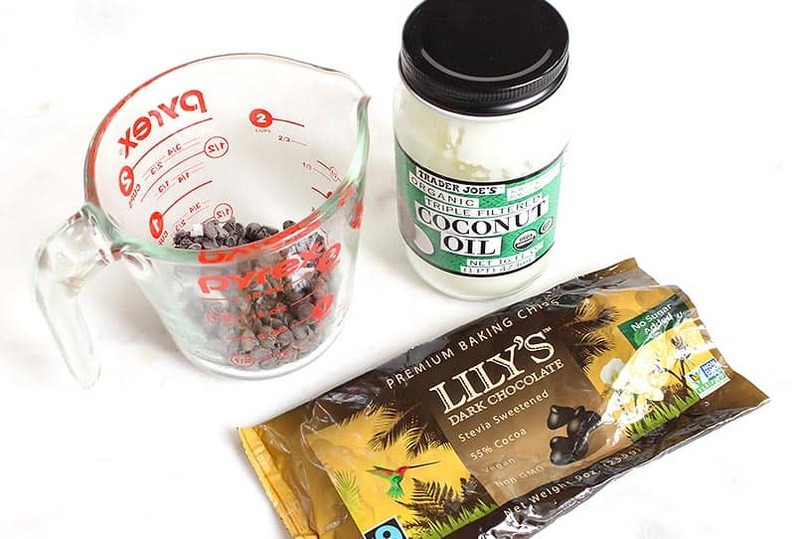 (2/3 of one Lily’s Dark Chocolate bar) and 1/2 tablespoon of coconut oil. For a thicker bar Double bar recipe. It works perfectly either way! If using a Cuisinart food processor, use the metal S blade. I hope you enjoy these as much as I do. Let me know if you make them in the comments below. YUMMY! Super ez and they taste fabulous!! Yay Deb! I’m sooo happy you liked it. These taste great and they are very quick to make!